Maltonic, a malt drink originally produced by Sona Breweries is back in the market after six years absence. The brand first made its debut in 1986 as a drink fortified with vitamin C, the company said in a statement. The drink went dormant in 2011 after the sale of Sona Breweries beer assets to Nigerian Breweries Plc. The ownership of Maltonic was transferred to Euro Global Foods and Distilleries Limited, a unit of Sona Group. Nigerian Breweries and Sona Group had a standing non-competition agreement for five years that prevented both companies from launching a competing product during that period. While commenting on the events that led to the relaunch of the brand, the Group Managing Director, Sona Group of Companies, Ajai Musaddi, said that it took the company eight to 10 months to retool the plant since the original malt drink was not produced in the brewery section. 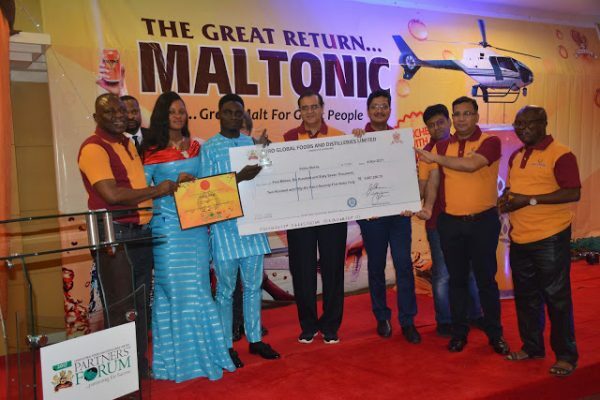 Musaddi added that “Maltonic is produced with 100% Nigerian Sorghum and raw materials in line with the groups’ avowed mission to execute major backward integration programmes to generate employment for Nigerians and produce brands of excellent, world-class quality. The Managing Director, Euro Global, Manish Uniyal, said Maltonic was also recently fortified with other vitamins. “The malt brand has undergone further filtration, rebranding and perfection processes to give consumers that natural, smooth and pure malty taste that no other brand offers. Naturally, this great brand is even greater as it is now enriched with multiple vitamins including Vitamins A, B1, B2, B6 in addition to the flagship vitamin C,” Uniyal said. The Group Chief Operating Officer, Sona Group of Industries, Mr. Ashok Maghnani, noted that Sona Group’s vision was to make Nigeria a major hub for the production of world-class goods. The event also witnessed distributors being appreciated and rewarded with certificates, plaques and cash. Mr. Andrew Onyike of Shina Stores received the star prize of N5.6 million while Jude Okolozo of Golden Pillars and Odinwamkpa Jude Amachi of Popular Nigeria Limited came first and second runners-up respectively. Mr. Felix Aighobahi, Sales Director, Euro Global Food and Distilleries thanked the Partners for their support in making Euro Global a great success story and implored them to replicate and improve on the Maltonic success of the past by making it available to the teeming consumers who deserve to experience a proudly Nigerian malt beverage like no other.